1. Blue Creek by Millie Gift Smith feels like November. For those of you with snow on the ground, stay warm and save us some hot chocolate. 2. Time to Vote! Voting is underway in our Think Pink 2013 Exhibit and the Flower of the Month: Clematis Exhibit. It wasn’t easy to pick my favorite, but it’s done! 3. EBSQ Artist Georgia Papadakis has an excellent How-To post for a DIY Tripod Arm and Video Set-Up. 4. 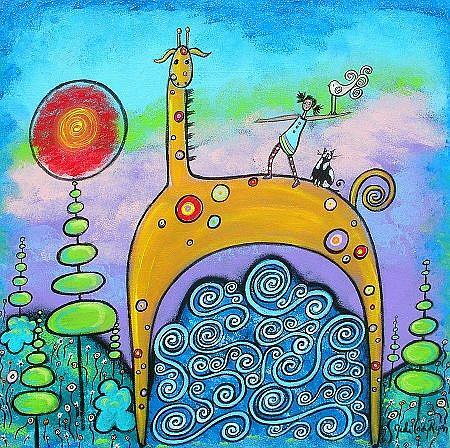 November’s Mandala from Maureen Frank is titled Putting Ourselves Out There, making your dreams a reality. Love it! 1. Open the 2 priority tube boxes and lay flat with brown side. 2. Pull the box bottoms away from the inside of both boxes. 3. 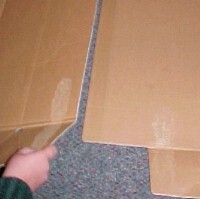 Remove the glue cover strip from box 2. 4. 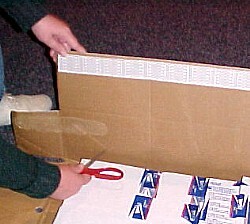 Line up the boxes evenly, then carefully set the right edge of box 1 over the exposed glue of box 2. Press firmly to seal. 5. Now you’re ready to determine the thickness of your box. 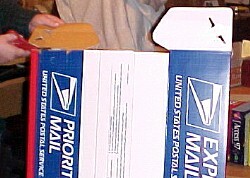 After preparing your painting for shipment (shown here sandwiched between 2 flattened boxes for protection), lay your art on top of the (now joined) box 1 and 2. 6. 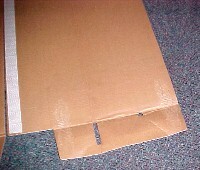 Place your painting beside the pre-existing fold crease of box 1. Fold up so the side of the box is next to your painting, and choosing how much extra width you prefer the painting to have inside the box and poke a small cut to use as a starting point for scoring a 2nd parallel folding crease (I prefer my box to be no more than 1/4 inch wider than my painting). 7. 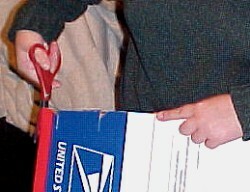 Using just one point of your scissors, gently run them from that starting point down to the opposite end of the box (from bottom to top). **Be sure you are not cutting clear through, as you only want to score a crease for folding. ** Repeat this on both sides of your painting. 9. 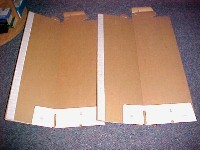 Moving to the bottom of box #2, cut your bottom side panel by snipping in the same area as on box #1, and then cut along your scored area up to the bottom crease. (Again, gray lines in the diagram represent your scored and pre-creased folds) Now finish that cut along the crease to the outer edge of box #2 , completely removing the larger portion with the pre-cut circle in it. Now, you’ll notice there is a gap in the center between the bottoms of box #1 and #2… Use the piece that you just cut away to fill the gap, and secure with tape. 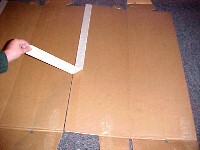 Lift A1 upward off the floor so that the side of your box is touching the side of your painting. Lift A3 up and fold over at the score – this will put A2 inside the box between the bottom and your painting. A3 should be folded over the front of your painting. 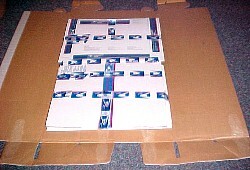 Repeat the same process to form a bottom on box #2… and secure with tape. 12. Both A1 pieces can now be folded over the top of your painting and taped to the newly built bottom. 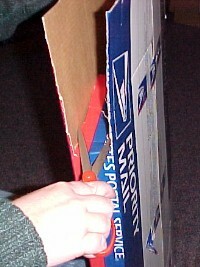 If your find that you have a gap down the center front of your box, you can easily fix this by taping an extra piece of cardboard from a 3rd priority tube box on the inside. 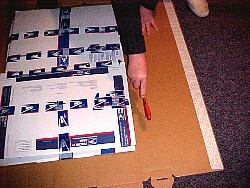 You can expose and use the glue strip from A1 of box #1 to help hold it in place while you begin taping. 13. Now you’re ready to stand your box up and create the top flaps. To begin, cut the original flaps off completely. 15. 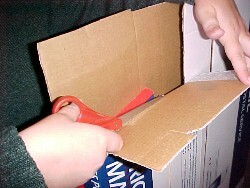 Open your scissors to measure the width of the box from front to back. Now simply rotate the scissors so they are upright along the piece you need to cut – they will already be spread to the height you’ll need your front/back pieces to be. 17. And begin taping. I use a LOT of tape – taping over the one remaining pre-cut circular hole in the bottom, any tiny opening, once or twice around the entire package (both vertically and horizontally), and at all the corners. This method works great with canvases up to around 36″. 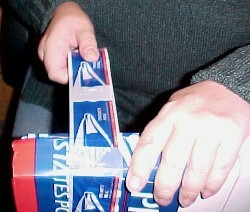 You could build bigger boxes with this method, just keep in mind the size limits for USPS.